Gi Group announced that Marcos Segador, previously European Category Manager at Selecta (Europe’s leading vending & coffee services company) has joined Gi Group India in the role of Country Manager. 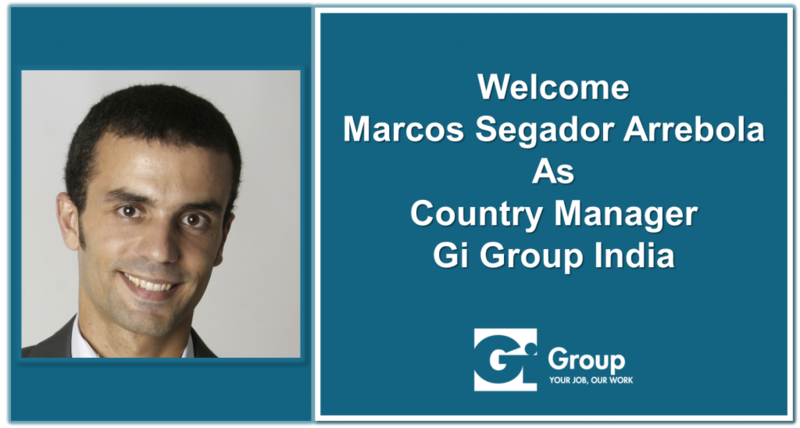 Marcos will be responsible for developing all the businesses of Gi Group across all the branches holding full P&L responsibility. In his years working in different roles and positions, Marcos has accumulated a vast experience in International Management, leading top performing multicultural teams and brands in over 15 countries. On one hand, the recruitment teams of Elixir Consulting (GIHR) set the standard for the industry with use of industry’s best candidate management system, which is followed by Gi Group globally. On the other hand, Gi Staffing Services (GiSS) has been adopting innovative practices in staffing industry and creating new benchmarks. Marcos is Telecommunication Engineer and International MBA from EADA Business School (Barcelona) and AIT School of Management (Bangkok & Hanoi). He had an intensive Induction held in Milan after his joining. In India, Marcos will be based out of Bangalore and will take care of all other nine locations and businesses from there. Gi Group is one of the world’s leading companies in the area of human capital solutions providing services in various domains of talent acquisition. The group is active in the field of Search & Selection, Domestic & International Recruitment, Temporary & Permanent Staffing, Recruitment Process Optimization (RPO), Executive Search and HR Consulting & Training. The group has direct and indirect presence and strategic partnerships in about 57 countries across Europe, Asia, America and Africa. In India, Gi Group has offices in 10 major cities. In the year 2017, Gi Group supplied over 20,000 companies, with a turnover of 1,920 million Euros. The Group has developed a strong expertise in recruiting for large and multinational organisations, for which it has implemented global solutions (e.g. Managed Services; Statutory Compliance) through specialist divisions and dedicated local and international teams. Gi Group has been present in India since 17 years, helping clients implement highly crucial projects through hiring great talent. It has been constantly innovating its services in order to remain ahead of times. Ranked globally and in India, as one of the largest staffing firms by Staffing Industry Analysts, the Group is also a Global Corporate Member of World Employment Confederation (WEC). In India, Gi Group is one of the founding members of Indian Staffing Federation (ISF) and is a long term strategic member of National HRD Network.